You just popped out of your house to check the mailbox in the front yard. As the door slams behind you, you come to the sudden realization that you just locked yourself out of the house, again. It is something that has happened before, though you are not willing to admit that to many people. You rush to the backyard in hopes that perhaps the back door is unlocked, but no such luck. What is lucky is that you happen to have your cell phone in your pocket. Which isn’t surprising since you don’t go anywhere without your cell phone, including out to check the mail. Anyway, while you are waiting for Bostons Locksmith, your emergency locksmith in Boston, you are sitting on your front porch thinking about all of the places you could hide a spare house key. You know, so the next time you lock yourself out of the house you don’t have to call a locksmith. You think about buying a fake rock or hiding the key under the welcome mat. But then you realize these are obvious places that would be discovered by others. You dig deep and do a little research and come up with a few solutions. Hidden in the trees, under a carpet of birdseed sits your spare house key. Just make sure that squirrel who steals the birdseed doesn’t decide to bury your house key with his other nuts. That’s right, you can hide your key in a fake sprinkler head. Just bury it in your yard leaving just the top exposed. People think it is simply a sprinkler head ready to do its duty, but in reality, it is hiding your house key. Well, they are functioning door knockers, but they slide open to reveal your spare house key. Knock, knock; who’s there? This probably sounds strange, but if you have a lot of trees in your yard, find one and simply nail your spare key to it. Of course, you will want to find a tree that is far from your house and high enough up so that people can’t see it at eye level. You could also just nail it to your neighbor’s tree to throw people off. If there is one thing burglars hate it would have to be dogs. In fact, burglars go through great lengths to avoid dogs of any kind, even small and noisy ones. Which is why it is a brilliant idea to hide your house key under a giant dog house. And if you are seriously considering hiding your key in any of these places, don’t. Think about it, if we know about these hiding places, there are others who know as well. In fact, burglars are experts when it comes to places to hide house keys and they have seen it all. So all of the above ideas are simply bad ideas. If you want to keep a spare key for emergencies such as locking yourself out of the house, there are much better ways. In all likelihood, you have a neighbor who is your friend and can be trusted. Should you find yourself locked out of the house while checking the mail, all you need to do is go knocking on your neighbor’s door and ask to borrow your spare key. The fake rock is a lousy spot to hide your key, it is just too obvious. The fake sprinkler head is less obvious, but a good burglar will check it. A hitch safe is a compartment that slides out of a fake car hitch to reveal your spare key. Your key is safe as you cannot access it without the combination. If locking yourself out of your house is a regular thing, you might want to consider a keyless entry system. With a keyless entry system, all you need to remember is your access code. Keep in mind that whenever you do lock yourself out of the house, a solution to your problem is just a phone call away. 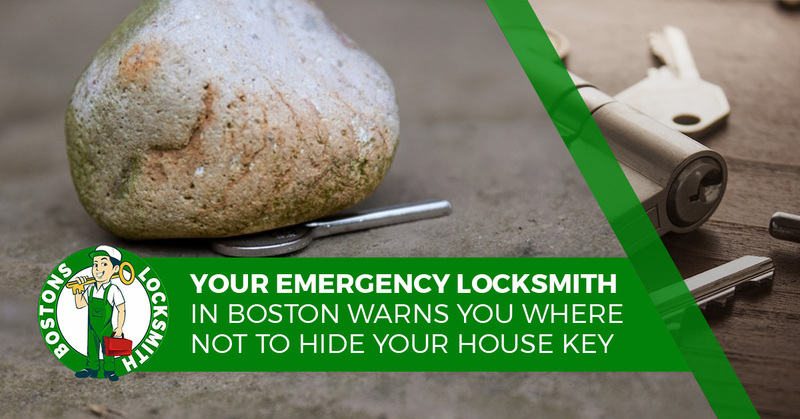 Call Bostons Locksmith should you find yourself locked out of your house.